The two-day Omaha event (photo above) is one of ILC’s most popular. 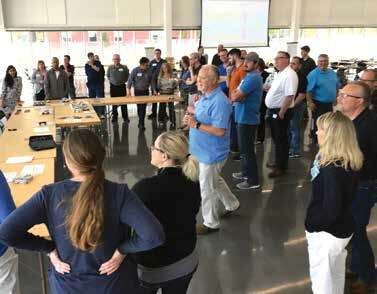 It included both discussion about the best culture for Lean organizations and teachings about the standards, flow, and employee development required to develop Lean. Richards praised the quality of the information—even the things she says Vermeer already practices. Sometimes in unexpected ways. For example, Richards picked up several new ideas from chatting with other participants during the event. One idea, acquired when Richards and her colleagues bumped into another group of participants on the way to a restaurant, has since been shared with Vermeer colleagues as a practice they might want to adopt. For more information, check the Iowa Lean Consortium’s events calendar at http://www.iowalean.org/event.